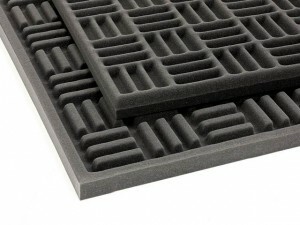 Although soundproofing and acoustic treatment are two techniques for altering the sound in a room, they serve different purposes and produce very different results. To learn which one suits your needs, check out the general uses of each. The goal in soundproofing is to prevent as much noise as possible from either entering or leaving a room. This is often used for music practice areas, nurseries, home media rooms, and similar spaces. Adding mass to the walls to reduce the vibration caused by sound waves. This is most easily and effectively done during the construction phase, but can be achieved in an already existing room with the help of materials like mass loaded vinyl. Using isolation products around the room to further attenuate sound. Door and window seals, dampening coating and adhesive, rubber decouplers, acoustic sound barriers, and even acoustic caulk are just some of the isolation products available to stop noise leakage. Eliminating or blocking off windows. Windows are a major source of sound leakage, so they must be addressed in your soundproofing efforts. For new construction, simply do not include windows in any room you wish to soundproof. For existing rooms, either double-glaze the glass (making sure the seals are airtight) or fill the window space with sandbags and nail boards across the whole thing. This step should obviously be avoided if natural light is needed or desired. Acoustic treatment refers to the process of placing materials in a room to enhance the sound quality as perceived by listeners within the space. This is often used in recording studios where ambient sound can drastically interfere with output quality. Using acoustic foam to cover the walls. Industry experts recommend at least 50 to 75 percent coverage for musical styles that involve varying sound waves, such as rock and pop. For styles that produce more uniform sound waves, such as classical or jazz, 25 to 50 percent coverage is often sufficient. Placing foam isolation wedges under speakers and monitors. Isolation wedges serve as a barrier between speakers, monitors, and mounting surfaces. This reduces vibration and auxiliary noise, which in turn improves sound clarity. Experimenting with acoustic panels, sound diffusers, and bass traps, as well as different speaker and monitor positions. So many factors contribute to a room’s acoustical output that it’s unlikely you’ll hit on the perfect formula on the first try. Therefore, it’s important to be willing to experiment with different foam accessories, sound equipment, and placement until you get the sound you want. Whether you’re interested in soundproofing a room or improving sound clarity via acoustic treatment, FoamByMail has the eggcrate foam, foam wedges, and other foam products required to get the job done quickly and affordably.